12 Years a Slave, Argo, The King’s Speech, The Artist, and Transformers: Age of Extinction. What do those titles have in common? If Paramount gets their way, all of those films will be Oscar winners for Best Picture. 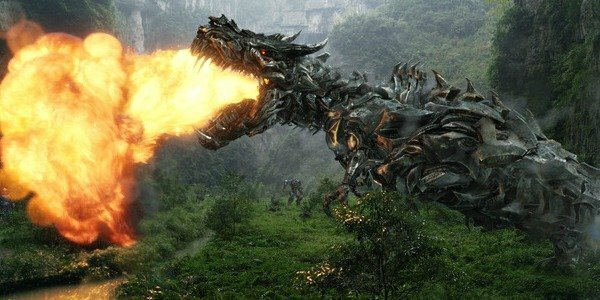 Yes, the movie with a robot semi-truck riding a robotic dinosaur that shoots flames from its mouth is being promoted for the Academy of Motion Pictures' highest honor. Paramount Pictures has posted an official "For Your Consideration" ad that suggests the studio believes the Hour of the Autobot is upon us. 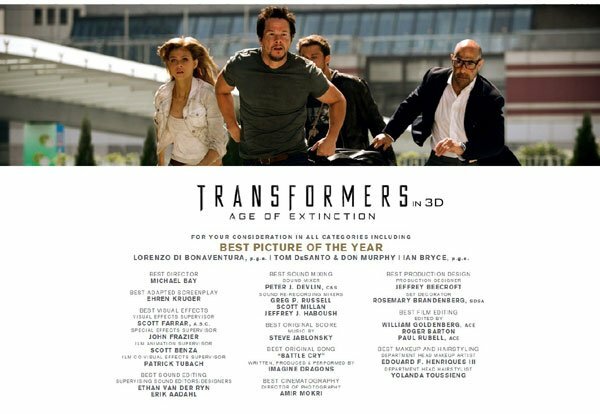 They aren’t only pitching Age of Extinction for Best Picture, but they are also promoting Michael Bay for Best Director, and Ehren Kruger for Best Adapted Screenplay. Maybe I’m a snob, but I’m not sure I’m ready for a world where Michael "I-Love-Explosions" Bay is an Academy Award-winning director. The Oscars certainly get a bit of flak for selecting Best Picture winners and nominees based on movies weren’t big hits at the box office. But while the Academy has worked to change that, attempting to include more nominees that appeal to the "general movie-goer," we’re certainly a long way from having robotic automobiles populating the Best Picture list. Or at least I hope we are. My own snobbery aside, this does raise a very important question: are the Academy Awards here to tell us what the truly greatest films were of the past year, ignoring box office sales, or are they there to offer accolades to the best films of the year with financial success considered? That being said, surely an Oscar Revolution is not going to start with Transformers 4. Yes, the film was a blockbuster success - one of the biggest of the year, bringing in well over $1 billion worldwide - but the movie was reamed by critics and fans alike (Did I mention the fire-breathing dinosaur Autobot? Because there was a fire-breathing dinosaur Autobot…). The basic plot of Transformers: Age of Extinction evolves around scientists trying to capture the technology and power exhibited by the Autobots - while at the same time a Deceptacon threatens the earth and freedom as we know it. And while the film may have been a fun ride, it certainly isn’t tilling any new ground in the Transformer realm. The question of "is Transformers Oscar-worthy" purely boils down to whether or not the Oscars should be marking excellence in filmmaking, or box office successes. We’ll have to wait to see what the Academy thinks when the official Oscar nominations are announced on Thursday, January 15, 2015. The Academy Awards ceremony will be hosted by Neil Patrick Harris on February 22, 2015 in Los Angeles’ Dolby Theater. You can pick up Transformers: Age of Extinction on DVD and Blu-ray now in stores everywhere to make your own choices on its Oscar worthiness.